The theme for this year's World Water Day on March 22 is water and food security. This is a fitting focus for Amman Imman's mission to bring water to the Azawak. The interrelationship between food and water is apparent everyday in this drought-afflicted, resource-scarce region. Without water, there is no food. Currently, due to last year's drought and poor harvest, all of Niger, and in fact all of the Sahel, is suffering a food shortage. Food prices have doubled and even tripled. In January, the Niger government reported that over 750,000 people were food insecure, and predicted that numbers would rise to over 1 million. Other reports predict even higher numbers. Last year, 200,000 refugees fleeing turmoil in Libya flooded into Niger. Conditions are worsening with fighting in Mali causing the exodus of 15,000 additional refugees into already food scarce Niger. A humanitarian crisis begs attention from the world. Read this new report on the hunger crisis across the Sahel published in Time magazine today. At Amman Imman, we are doing our utmost to aid our borehole communities in the Azawak that now have water. We are providing staple grain, which the community can sell to community members and visitors at less than half the price it can be found on the market. A percentage of the profit from the grain sales will go to the women for their projects, including restocking their cereal banks. The rest of the profit will go toward their borehole fund, as an additional security measure if and when borehole repairs need to be made. As a longer term strategy, we are conducting gardening training among all community members - including school children - as well as providing tools and seeds. For World Water Day, Amman Imman is offering a presentation about water and food security in the Azawak region of Niger. 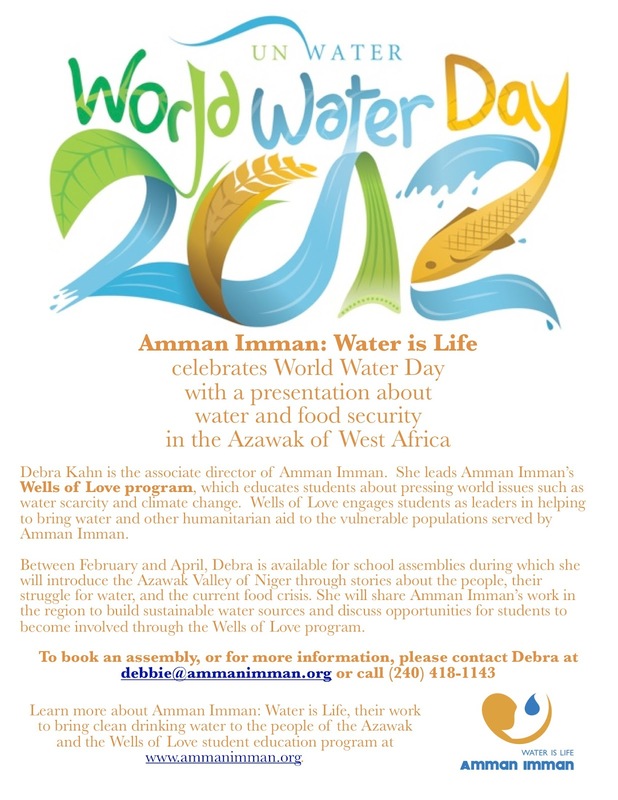 If you'd like to schedule an assembly at your school or for your group this spring, please contact Debbie at info@ammanimman.org.